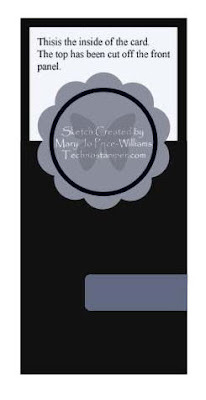 Whew....another Monday, another sketch challenge from MJ over at Techno Stamper. For this weeks sketch, I used my long neglected Lovely as a Tree set, along with the sentiment from Holidays and Wishes. My tree image was stamped in Chocolate Chip, to add color and dimension to the tree, I used the Pencil over Marker Technique (past TJNL). I used my coluzzle to cut out my circles. On the largest circle, I used my Corner Rounder, to create the scallop edges. Simply remove the guard on the punch, and begin punching one right next to the other barely overlapping to create the scallop. Then I used my Cutter Kit to add some dimension to the edges. 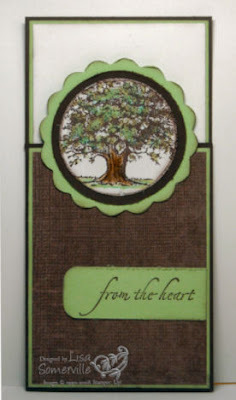 To add some extra depth to the front of my card - I layered a piece of Afternoon Tea DSP onto my Gable Green card stock that I had sponged some Chocolate Chip ink on. The inside of the card also have a layer of Gable Green and a piece of White card stock, both have the edges sponged in Chocolate Chip. If you'd like to play along with this weeks sketch, simply leave a link to your project on this blog post, or if you upload to SCS, please use keyword TSSC18. I so love that set it seems to never go out of style -- every year I wonder if it will retire and hope that it doesn't. Your card turned out great, you did a fabulous job coloring the tree. That is one of my favorite techniques too! As always, thanks for playing. You are quick today on this! Great card, Lisa. Beautiful card Lisa and that's for that visual...no matter how many times I looked at the sketch I couldn't figure it out. I'll have to find some time to stamp today! Very pretty card. I love that stamp set too! I don't know if my first comment made it so I am going to try again. If this is the second just disregard. I love that stamp set and love your blog. (I think this sums it up nicely). You used one of my all time favorite stamp sets. I too hope it never retires. Although I'll never get rid of it even if it does. Great take on the sketch. Love how you worked that tree into the circle. Perfect! Your card turned out awesome. I just love those colors together! And you used the tree that I always neglect, so I'll have to be better in th future and use IT more! This is gorgeous Lisa - I love how you did that tree! I am so glad that set is not retired yet, I love mine!